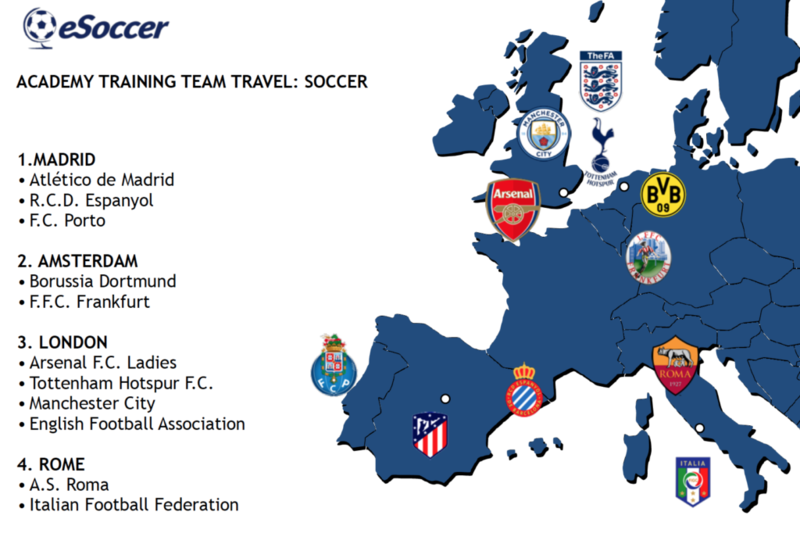 As soccer continues to grow internationally, we are always look for ways to help connect youth and coaches from all over the world with professional European soccer clubs through Academy training programs, international tournament play, clinics and coaching education. We are so excited to unveil our newest programs and destinations for 2019! We continue to work from four different Hub locations within Europe, each chosen for the strength of the program and our superior access. These Hub cities are: Madrid, London, Amsterdam and Rome. Each of these hubs is a European football capital with exciting tourism opportunities, and an international airport which gives our travelers lower flight costs and more flight options. We have extensive experience organizing programs in these destinations, meaning that our networks there are unmatched. Our relationships with professional clubs in the area mean inside access to Academy training facilities and quality Academy coaches, and our knowledge of local youth football clubs will result in friendly matches that are level appropriate for your team. We are excited to announce our newest training program destinations for 2019, Manchester City F.C., Borussia Dortmund, F.C. Porto, A.S. Roma and the Italian Football Federation. Borussia Dortmund is the second largest soccer club in Germany and one of the most successful in German soccer history. BVB or Dortmund, as the club is referred to for short have won eight German championships, four DFB-Pokals, five DFL Super Cups, one UEFA Champions League, one UEFA Cup Winners’ Cup, and one Intercontinental Cup. Dortmund’s Youth Academy is one of the most potent in Germany. The club believes that having a strong youth academy is the key to success at the senior level and focuses on fostering the growth of their young talent. The club has notably produced World Cup champions in Mario Gotze and Marco Reus, while also graduating many first team players like Christian Pulisic, Nuri Sahin, and Marcel Schmelzer. F.C. Porto was founded in 1893 and is one of the Portuguese ‘Big Three’ – one of three clubs that has never been relegated from the top division since its establishment. The Youth Academy is widely known throughout Europe for its high performing teams. You’ll experience its youth development philosophy firsthand while visiting the beautiful, riverside city of Porto and exploring its winding streets and medieval architecture. The A.S. Roma Youth Academy is considered to be one of the top ten academies in European soccer, producing more soccer players playing in Europe’s five top leagues than any other club in Italy. The club focuses on nurturing young challenge with the hopes that they will make it to the first team. Many soccer greats have moved up through the rankings at A.S. Roma, like Daniele De Rossi, Alessandro Florenzi, and AS Roma’s all time leading goal scorer and Italy’s golden boy Francesco Totti. The Italian Football Federation was founded in 1898 and is the governing body of Italian soccer and organizes the professional divisions of Italian soccer as well as the Italian national soccer teams. The primary training grounds are located at the FIGC headquarters in Coverciano in the hills of Florence, Italy. The state of the art facilities include five turf and grass training pitches, one futsal pitch, a sports hall, an ultra modern gym, lecture halls, hotels and restaurants for players and guests. Gli Azzurri (the blues) as the Italian national team is known, referring to the blue color of their main uniform, is one of the most successful national teams in World Cup history garnering four World Cup titles. Some of the most legendary footballers of all time have come through the doors of the FIGC including arguably the best goalkeeper of all time, Gigi Buffon; free kick specialist Andrea Pirlo; and Italy’s most notorious strikers Francesco Totti and Alessandro del Piero. International tournaments allow an opportunity to join our Academy training experiences with international tournament competition. In 2019 we will continue to work with very closely with the Donosti Cup held in San Sebastian, Spain. We also offer training experiences with the MIC (Mediterranean International Cup) held outside of Barcelona, Spain and the Valencia C.F. Soccer Cup in Valencia, Spain. All of these tournaments can be combined with a few days of training with a professional youth academy in Spain. Many opt to start their tournament travel with training sessions at Real Madrid City with Real Madrid Foundation coaches, before heading to their tournament destination. Interested in traveling with us in 2019? Get in touch!